Feeling my oats after getting those 2 pictures of the girls in front of Central Park, I decided to keep things going and headed out to the West Indian Day parade going on in Brooklyn that day. Still it would probably almost be over when I got there, so the shots would be scarce. This more or less turned out to be the case. Even so my trip there netted me my favorite children's candid shot of all time. 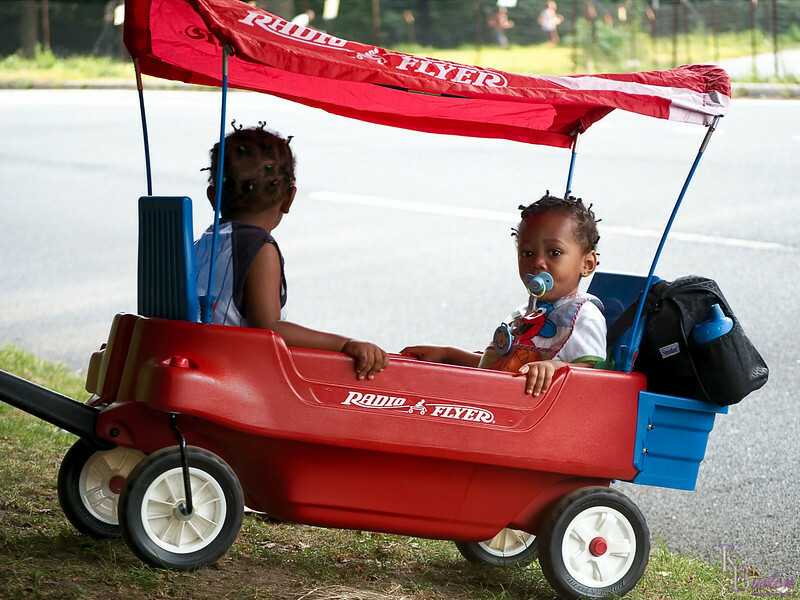 I spotted this adorable pair being pulled by their father in that great 'Radio Flyer' almost a block ahead of me. I followed them as I weaved through the huge crowds for several minutes trying vainly to frame them up in my viewfinder. But every time I closed the gap I'd loose it when I stopped to frame up the picture. My luck turned when their parents stopped to ask some policemen a question, and that allowed me to get close enough to get the size image I wanted, but stopping to frame them up kept resulting in cut off body parts, or facial expressions that just missed the mark. Eventually their parents made a left to head up an embankment that took them into Prospect Park itself. With my potential picture about to disappear into the tree trunks, I madly ripped off shot after shot trying to capture that one magic image. Finally on the very last shot I took I succeeded, and then they disappeared into the woods, and I never saw them again. Words can not express how elated I was when I flipped my camera around and looked at this image in my view screen.